Built with the spirit of athleticism is as appropriate to this 30-second commercial as it is to the new Mitsubishi Eclipse and Eclipse Spyder cars it so strikingly promotes. Aron Hjartarson may have got into animation by accident but as Head of 3D at The Mill it's great that he also directs. 'Robot Factory', his first fully computer-generated spot, is a remarkable piece of work, which he and his team completed in just ten weeks. Set in an ultra-efficient car manufactory, with a strong sense of sports arena, a sleekly athletic robot notices a malfunction on the production line. The robot, its moves simulating those of football, hockey and basketball, does a composite sports sprint along the factory floor to successfully slam dunk a missing wheel on to a car before it reaches the end of the line. 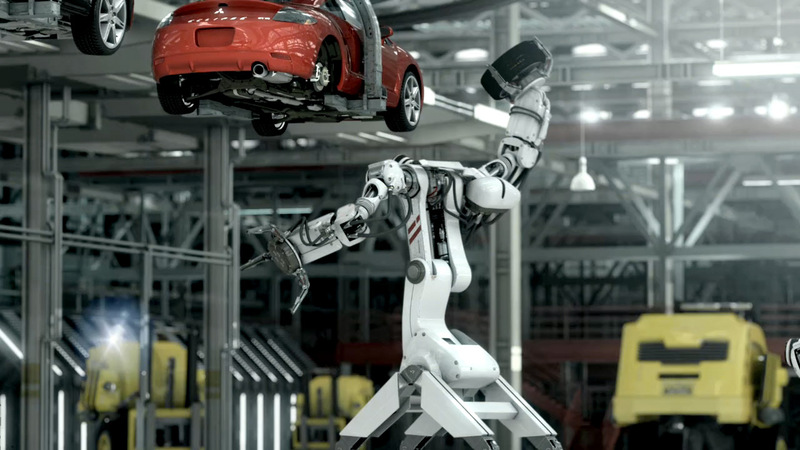 Before making a prototype robot to demonstrate its athletic body and moves, Aron visited Mitsubishi in Illinois to film reference shots. "It was very helpful to see the real robots and factory and to understand the level of detail in them," he said. "There are so many little light sources, pools of light everywhere, pipes, signs, steel beams, suspended structures, mezzanines." Aron with Pete Marin, Joshua Merck and Whitehouse editor Adam Robinson worked closely on the pre-vis and concept. Adam practically lived at The Mill when Joshua was roughing out the animation. As Joshua says, "Unlike a traditional edit where you work with what you are given, Adam could be specific about what shot would work within the edit, and his intense love of sports was also very helpful!"